In the midst of current affairs in Egypt where people are debating over the constitution that has been set before them to vote on, I would like to present to you one of the oldest, if not the oldest constitution in history. I think you will see once you have read all 42 points we could all take a lesson in how we should conduct ourselves. 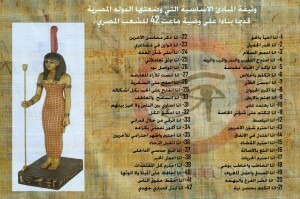 Here is the main constitution that has been set for thousands of years by Ancient Egypt with Maat (the Goddess of Justice & Human Rights) as the protector over it as shown in the picture. Please feel free to share this post and please like us on facebook to make your comment on this blog.